Is FDA ‘Shadow Ban’ Causing Kratom Shortages? The American Kratom Association (AKA), an advocacy group for kratom vendors and consumers, came out with an alarming bulletin this week. “BREAKING: FDA Commissioner Scott Gottlieb is shutting down kratom supplies shipments to the United States. 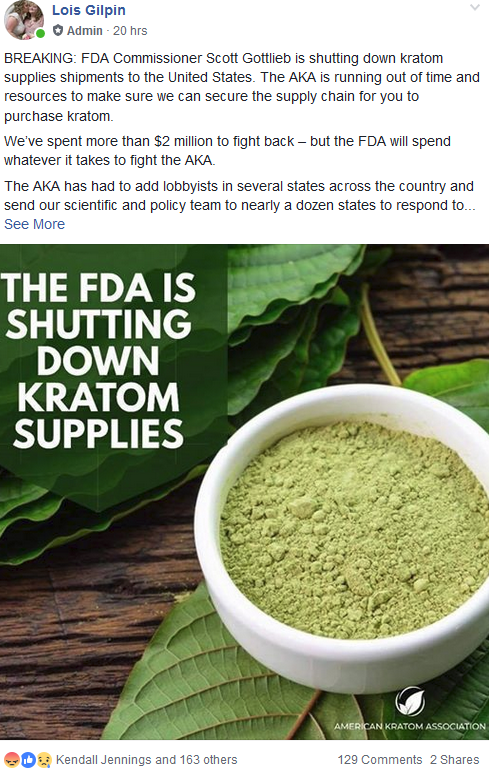 The AKA is running out of time and resources to make sure we can secure the supply chain for you to purchase kratom,” read the post on the AKA’s Facebook page. The bulletin claimed the FDA was trying to “criminalize kratom users” and then launched into a fundraising appeal asking supporters to “dig deep and send a contribution right now” to the AKA to support its lobbying efforts. At best, the AKA’s bulletin was premature. At worst, it was misleading. Gottlieb is certainly no friend of kratom, but he’s not issued orders shutting down imports of kratom, an herbal supplement long used as a stimulant and pain reliever in southeast Asia. The FDA declared an “import alert” for kratom in 2012 and again in 2014 – long before Gottlieb became commissioner – authorizing the seizure of dietary supplements containing kratom. Several large shipments were confiscated as a result of the alert, but clandestine imports of kratom into the U.S. continued largely unchecked. Kratom has since become widely available online and in many smoke shops, and millions of Americans have discovered kratom can be used to self-treat their chronic pain, anxiety, depression and addiction. AKA president Dave Herman told PNN the bulletin was based largely on anecdotal reports from a handful of vendors who had kratom shipments confiscated in recent months. “I’m sure some of them don’t want to talk about it, but I’ve talked to at least four or five that said their stuff has been grabbed,” Herman said. “I know of one vendor that had a hundred tons literally confiscated. Herman said some kratom vendors are down to a few weeks supply. “There’s a lot of fear about what’s going on out there,” he said. Inflammatory rhetoric and scare tactics have become increasingly common in the escalating debate over kratom. More recently, Ohio health officials have claimed kratom produces a “heroin-like high” and was being used intravenously by drug addicts – a notion that most kratom users found preposterous. “Who the hell is injecting kratom? These people are out of their minds,” one reader told us. The FDA did not directly respond to a request for comment on the AKA’s bulletin, only saying that “certain kratom products and importers” were targeted in its 2012 import alert. But Herman says it is clear to him what’s happening in 2018. “It’s a full demonization. I don’t think there is any doubt about that,” he said. When asked if the AKA bulletin could incite fear and lead to hoarding and price increases, Herman was circumspect.